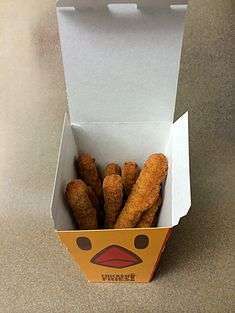 Chicken fries are chicken nuggets shaped like French fries. KFC, Canada – Introduced in 1997, pulled later that year. They were re-introduced in August 2006 and were available until 27 September 2006. They returned in the summer of 2007 with cheese in the center, as "Cheesy Chicken Fries". ↑ "BK launches chicken fries" Archived 21 September 2007 at the Wayback Machine.